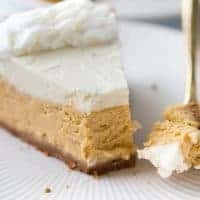 Gluten-Free Pumpkin Cheesecake! NOBODY will guess this is gluten-free! Lightly spiced, creamy and totally luxurious. The perfect crowd-pleasing holiday dessert! Preheat the oven to 350F. In the bowl of a food processor, add the Glutino Graham Animal Crackers and walnuts. Process until the mixture resembles sand. Add the brown sugar and cinnamon and pulse to combine. Remove the food processor blade and stir in the melted butter. Press the crumbs into the bottom of a 10-inch springform pan. Place the springform pan on a foil-lined larger baking pan and bake for 6-8 minutes, until the crust is lightly golden and toasted. Let cool before adding filling. In the bowl of a hand or stand mixer, add the cream cheese and sour cream and whip until fully incorporated. (Be sure the cream cheese is softened!) Add the cornstarch, sugar, cinnamon, nutmeg and cloves and mix until evenly combined. Mix in the vanilla and pumpkin until fully incorporated. Pour the filling over the cooled crust. Smooth the top and return the oven (keep the pan on the foil-lined baking sheet). Bake for 45-60 minutes until the edges are set and the center jiggles just slightly. Let the cheesecake cool completely to room temperature. In the bowl of a hand or stand mixer, combine the cream cheese, nutmeg, vanilla, and powdered sugar. Mix until smooth and combined. While mixing on low, slowly add the whipping cream over 1-2 minutes. Increase the speed and whip until fluffy. Spread evenly over the cooled cheesecake. Refrigerate for at least 1-2 hours or up to a day. Garnish with a light dusting of freshly grated nutmeg, if desired.